If you wish to buy books, CDs or downloads visit the orders page. Click on the thumbnail pictures for more details on each item, and click to view pdf brochure of unicorn songbooks & downloads. These books contain the pick of the songs from Unicorn Voice Camps - lots of World-Music, shorties and original songs by members of the Natural Voice Practitioners Network. Click on the image for details about each book as a pdf. 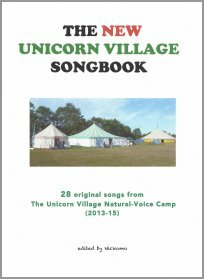 Unicorn Natural Voice Songbooks volumes 1 to 5 comprise scores of selected short songs from Unicorn Voice Camps 1998 to 2012 available as hardcopy and dowloads. The New Unicorn Village Songbook comes as a package - scores, demonstration recordings and mp3s of all the parts making them easy to learn. Original songs from the Unicorn Village Natural Voice Camps 2013 - 2015. The New Unicorn Village Songbook is 28 songs with book, audio CD of the demos, and a CD ROM with all of the parts as mp3s, retailing at £25 hard-copy (book & 2 CDs), and £20 for download (pdf & mp3s). Audio samples of all the demonstrations - click on to hear mp3 files.